Millions of traveler reviews, photos, maps from TripAdvisor. Know better, book better and go better. 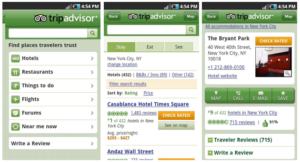 With over 350 million reviews and opinions by travelers, TripAdvisor mobile app makes it easy to find the lowest airfare, best hotels, great restaurants, and fun things to do, wherever you go. And booking options for hotels, restaurants and flights are just a tap away. You can also access contact details; search for nearby establishments; explore restaurants by food type, price range or rating; check out air fares; and even add to the knowledge base by posting your own reviews, images and entries for the places you visit. Review cities trip Advisor without Internet. 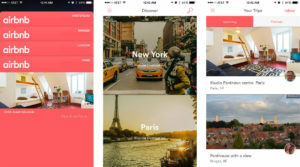 Make travel planning as mobile as you are with the Airbnb app. Airbnb opens the door to the world’s most interesting places to stay and is the simplest way to earn money from your extra space. With over 2 million listings in more than 34,000 cities, Airbnb connects you with the experience that’s right for you. Message hosts and guests, gush over your itinerary, explore fairytale destinations, and add unforgettable digs to your Wish List. Make that penthouse, yurt, or tree house your next home…or open up your own space to travelers. Explore legendary properties, vacation homes, and apartments, and add them to your Wish List to share with your friends. 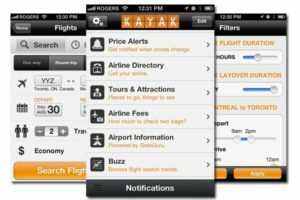 In KAYAK mobile app you can search flights, hotels and rental cars from hundreds of travel sites so you don’t need to. Compare flights, get travel updates and stay informed with free real-time flight status alerts. Travel plans and trip information are just a tap away with the Trips feature, while the Flight Tracker helps you track a flight at any time. Book hotels and rental cars with a tap, or view hotels in your area and call instantly to take care of last minute travel plans. 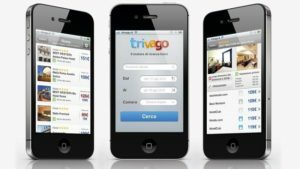 Whereas other mobile apps and websites compare the cost of hotel rooms, Trivago goes one step further and compares room rates on the main hotel booking websites such as booking.com, hotels.com and lastminute.com. So if you want to stay in a particular hotel it can tell you the cheapest site to book it through. Alternatively, if you need a hotel bed for tonight it can also use your current location to find a nearby hotel with availability and, again, the cheapest agent to book it through. Trivago is completely free, and you’re not required to sign up in order to use the service. This is because Trivago aggregates hotel deals from other booking sites (e.g. Hotels.com, Expedia, Agoda, etc. ), who then pays Trivago a commission for the referral. Hipmunk also includes an agony index for flight duration, number of stops and other factors. Users can also take advantage of last minute hotel deals, view reviews from TripAdvisor and other sources, and check out heat maps that show hotel proximity to shopping, dining and entertainment venues. Hipmunk’s hotels are shown on a map so you can see exactly where you’ll be staying. You can also read TripAdvisor reviews in the mobile app and turn on heatmaps to see which are the best areas to stay in based on unique interests like food, landmarks, nightlife and more. Availability of the Hotels at better deals at other Travel websites through the application. Discover different destination on different categories divided in the application.